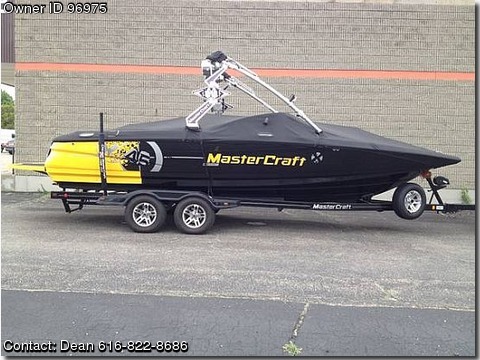 Please contact the owner directly @ 616-822-8686 or dean@startnewfinancial.com…2008 Mastercraft X45, BEST COLOR COMBO ON THE WATER 6.0 LITER 400 HP ENGINE UPGRADE BEST HP TO WEIGHT RATIO AND DEPENDABLEUPGRADED CLOSED COOLING SYSTEM ADDED ENGINE LIFELOW HOURS 75GALVANIZED MASTERCRAFT TRAILER EXTRA&#39;S INCLUDED:BIMINI TOP WITH COVERCOLOR MATCHED FIBERGLASS SWIM PLATFORMSNAP IN CARPET 4 TOWER SPEAKERS WITH 2 WITH FORWARD LIGHTSMASTERCRAFT COVERSTANDARD MASTERCRAFT OPTIONS X45 STANDARD BALLAST TANKSDUAL BATTERIES (2012) WITH PERKO SWITCH STEREO AMPS CD IPOD PLUG ECTVDIG CENTER GAUGE TO RUN ALL YOUR SYSTEMS ON THE BOAT WITH OWNERS MANUAL TO LEARN ALL THE FEATURESTUBES, LINES, PRESERVERS INCLUDED. Wakeboard Boat Review: With any other wakeboard boat company, the MasterCraft X-45 would be the biggest, baddest model in the lineup. MasterCraft&#39;s got the monster 28-foot X-80, though. Still, the MasterCraft X-45 shouldn&#39;t be overshadowed. It has room for 18 people, it has a beefy wake and it has the very cool VDIG dash display.Hull: This is a modified step design that&#39;s able to handle the chop found on bigger water as well as sculpts wakeboarding wakes. At more than 24 feet long and at the maximum trailerable width with exhaustive construction methods applied throughout, the X-45 is a solid ride for just cruising across that open water.Ballast: The 1,000-pound capacity of this factory ballast system — two rear tanks at 350 pounds each and a 300-pound bag — is just part of the story. MasterCraft supports all of it with heavy-duty pumps that aren&#39;t just plastic live well pumps. They won&#39;t burn out, and they have changeable impellers for easy maintenance. Extra ballast can go over the integrated tanks too. Tower: The ZeroFlex tower does a great job of branding the wakeboard boat as a MasterCraft, with the big logo running up the side of the rear supports. We also love how secure the racks keep the boards, even at cruising speeds. They easily swivel into the interior.Wake shaper: This is the only X-Series boat that comes standard with the Wake Adjustment Plate and one of the few it&#39;s even available on. It can come in handy on mellowing out the wake shape for less-experienced riders.Highlight feature: We can&#39;t say enough about the VDIG. This video-screen panel on the dash has intuitive controls with the best visuals we&#39;ve seen to show ballast configuration, lake depth and more. And we like the preloaded Rusty video clip. The wake: These big wakes are somewhat on the steep side of the spectrum. Advanced riders will be able to challenge them right away and launch off the lippy peak. Beginners may want to make some adjustments to the ballast and wake shaper.